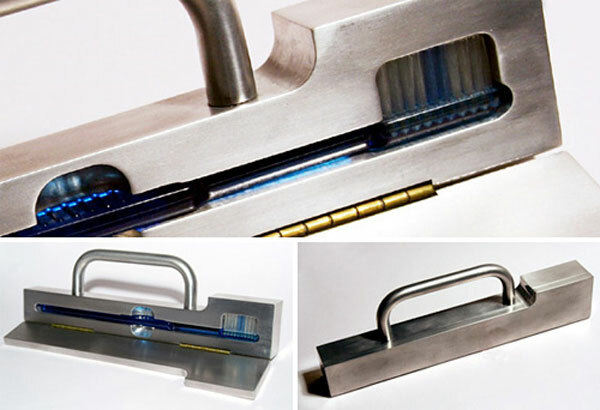 Here is an interesting design for a toothbrush holder from designer Dominic Wilcox, the Unibody Aluminum Toothbrush Holder. It looks like something James Bond would use to carry his toothbrush around in. The Unibody Aluminum Toothbrush Holder is designed to keep you toothbrush germ free, and it also look pretty cool as well. We have no idea if these Unibody Aluminum Toothbrush Holder’s will be available or if it is just in the design stage at them moment, I suppose yould always make a similar one if you have some serious metal work skills.